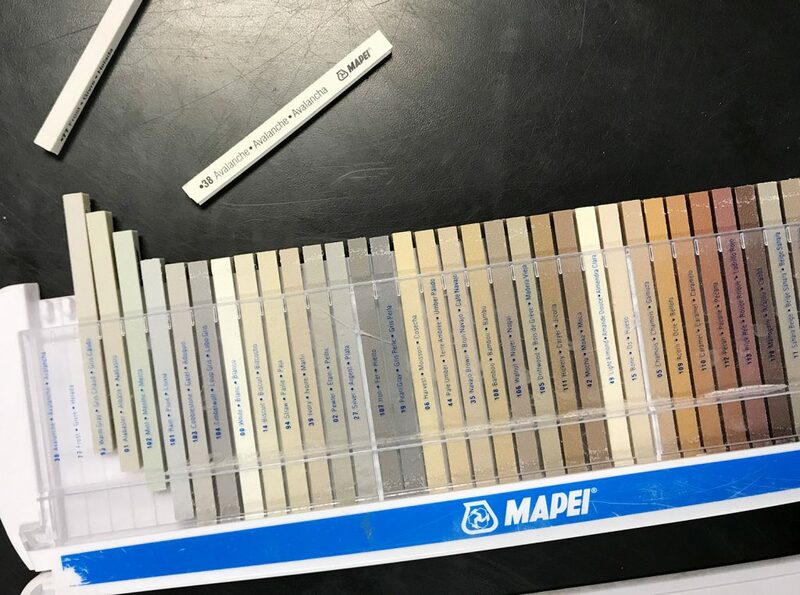 If you’ve got a tiling project in your future (even the distant future), remember, bookmark, voice memo, tattoo, or do whatever you need to do to remember Mapei Flexcolor grout. I know this sounds like I’m overreacting, but take it from people who have grouted 7 bathroom floors, 3 showers, 3 mudrooms, and 2 backsplashes in the last two years: this grout has been life-changing. 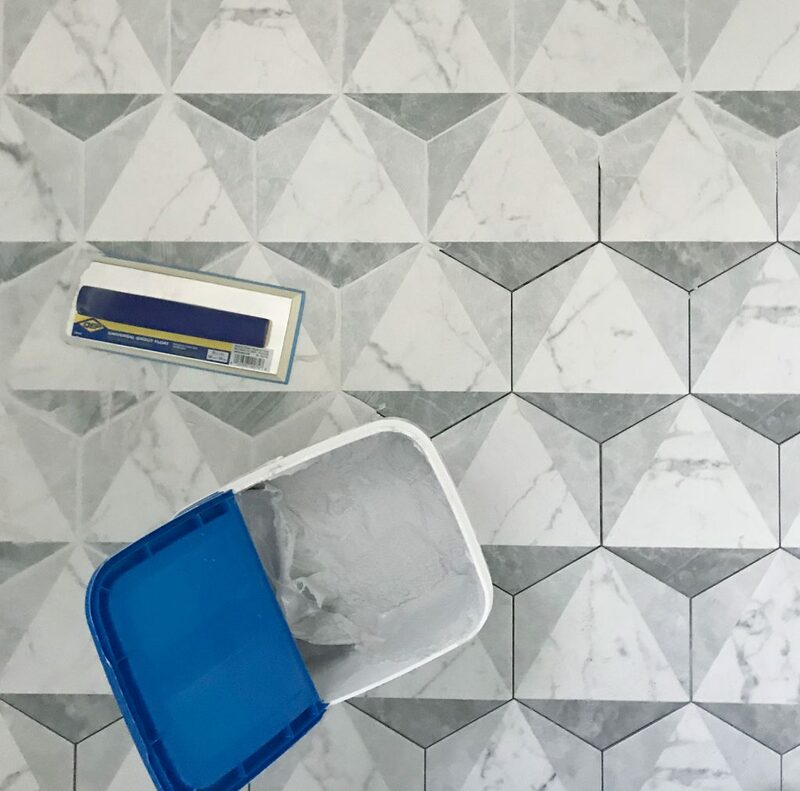 And no, this is not sponsored by either Mapei or Floor & Decor, which is where we typically buy ours (sorry, necessary disclaimer because this post is going to sound pretty gushy). 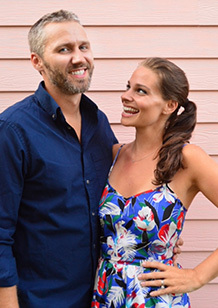 I meant to proclaim our love for this grout after finishing the beach house tiling two summers ago but we got sucked into the duplex and, well, this post never got written. But the duplex tiling just gave us more time for our romance to blossom, so I wanted to tell you why this has become THE ONLY GROUT we ever buy & use. We are going on 2+ years of not buying a single other type of grout (we don’t even look their way – our heart is TAKEN). Even our contractor swears by this stuff. That’s actually how we found it. 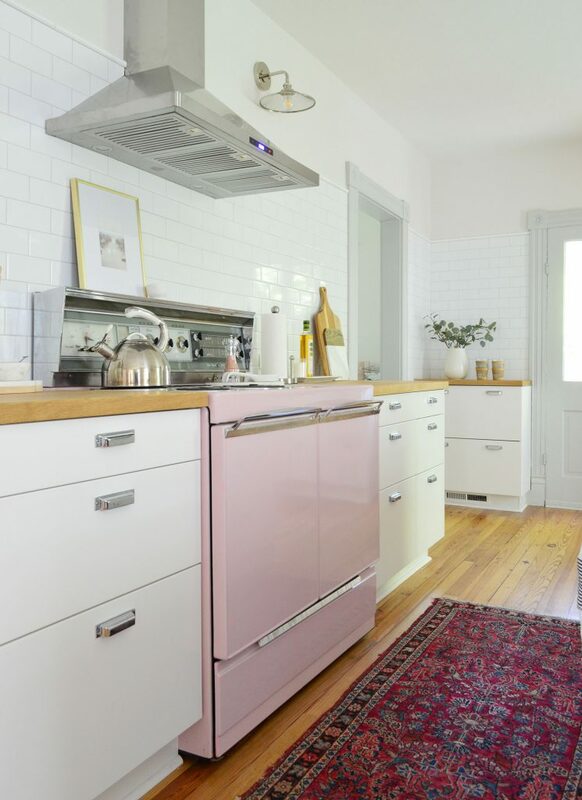 So I’m going to just dive into all the whys of that very big statement about grout – and I’m also going to toss in some tips for picking the right grout color (including our go-to color that works nearly every time – we’ve used it in so many rooms) and my new trick for minimizing grout haze while I’m at it. 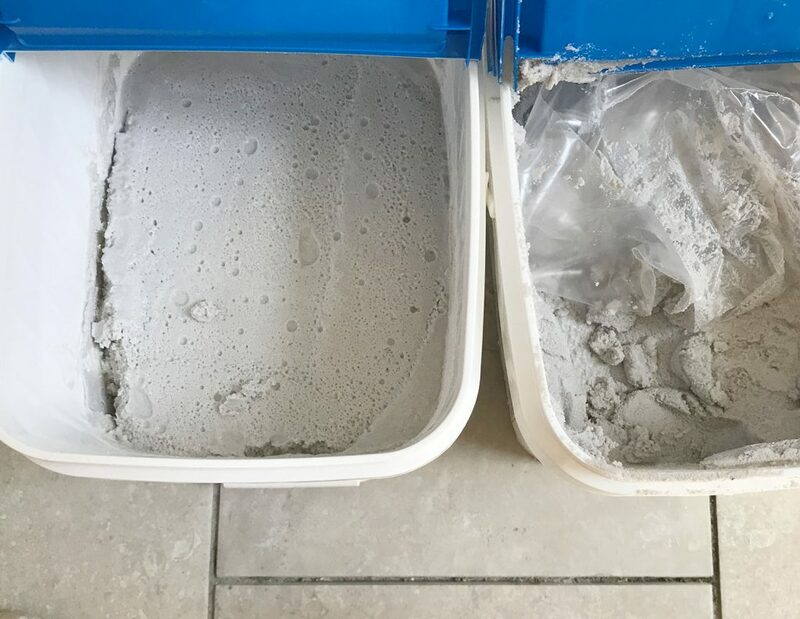 If you’ve ever mixed your own grout, I don’t need to say much more about why pre-mixed is a better experience. For starters, it eliminates a lot of time and effort spent measuring out your powder and liquid additive, stirring it together, and adjusting until you get the right consistency. Instead, you can just pop open a tub and get going. But a lesser appreciated benefit of premixed grout is that it also ELIMINATES COLOR INCONSISTENCY. We ran into this problem when grouting our covered back porch. We used a dark grout for the first time and the way that we mixed/applied it caused it to dry lighter in some spots than we had hoped (some areas that we mixed ourselves must have been a little more watered down, so it dried a slightly different color in those spots). It wasn’t a huge deal, but we were definitely disappointed that after all that time and labor it didn’t look consistent. So using premixed grout means you don’t have to worry about your color changing from one mixed batch to the next. And the last thing I’ll say about pre-mixed grout is that it also stores well for touch-ups later (like if you drop something heavy and pop some grout out of a crack and you need to smear some more onto that spot, or if you see that you missed a spot). The tubs seal up nicely (firmly press the lid down until it snaps all around the perimeter and that’s it), so I’ve really appreciated reopening grout that’s over a year old to use it for another project and finding it fresh and ready to go. Again, need I say more? Probably not, but that’s never stopped me before. 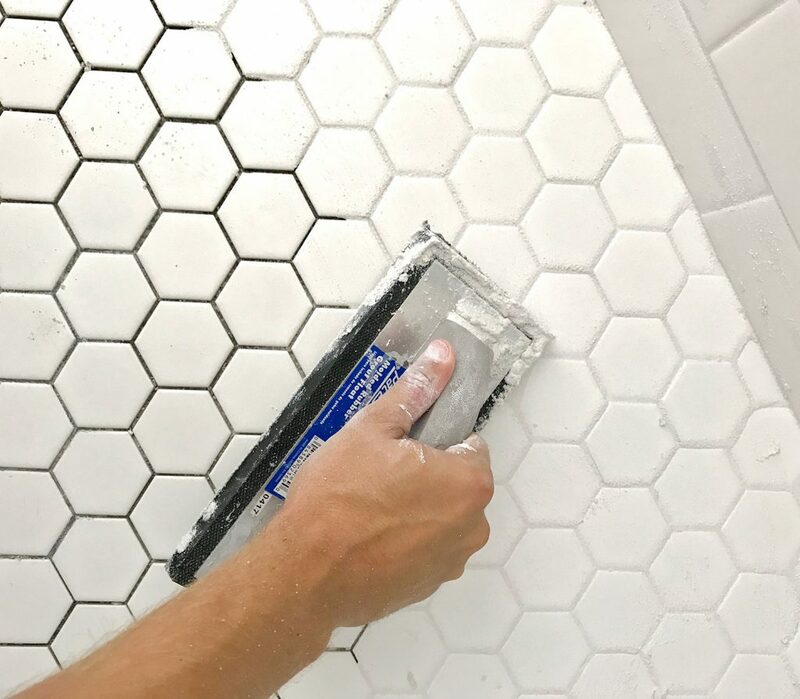 Tiling already has enough steps involved so I’m always happy to eliminate one, especially the annoying ones at the end like sealing your grout to prevent stains. 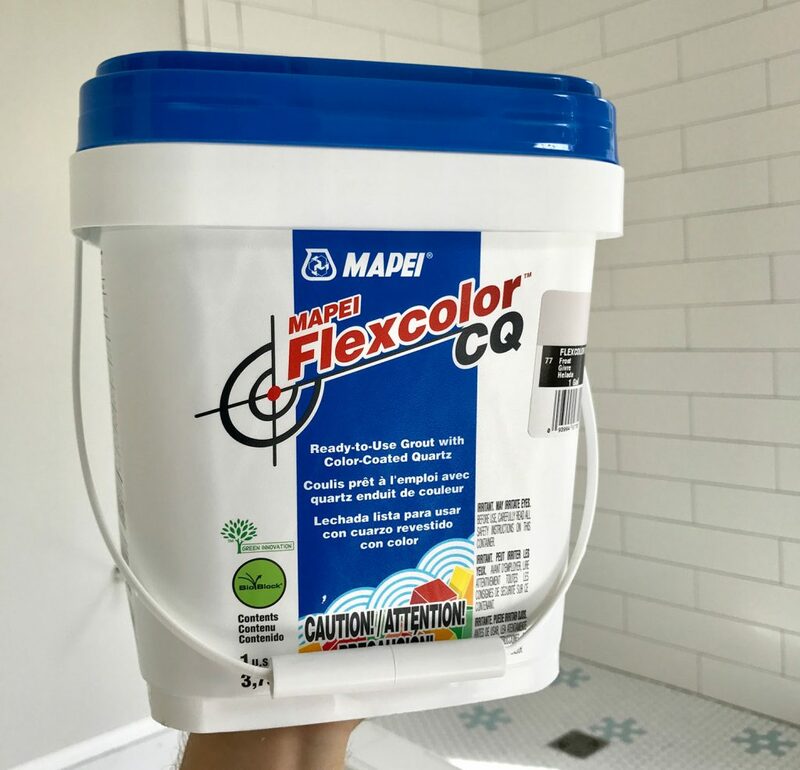 This Mapei Flexcolor is somehow formulated to prevent stains (how, I don’t know – magic? crystals? the dark arts?) so all you have to do is let it cure for 3 days and it’s good to go (you can walk on it after 24 hours). I should disclaim that it’s water-based stains that this grout is resistant to and like any “stain resistant” surface, you still probably shouldn’t slather marinara on it and let it sit for days. But we’re over 18-months in on the beach floors and they’re still looking as good as new. As in, not a single crack or stain. Anywhere. In any of the three bathrooms, the mudroom, the backsplash. Everything looks as good as the day we grouted it. In fact, I took the photo above this weekend, over a year & a half after we grouted just to demonstrate that this stuff goes the distance. Looks like new, eh? Old grouts that we used to use recommended a special liquid additive in place of water that made it more flexible to help it resist cracking or shrinking. So it was extra money and an extra step. Meanwhile, that feature is built right into this formula, and we have never had it crack or shrink in all of our years of using it – which isn’t something we can say about the other grout we’ve used (even with that special liquid additive). Tiling indoors? This grout works. Tiling outdoors? Still works. Got a small 1/16″ grout line? Cool. Got a big 1/2″ grout line? That’s fine too. 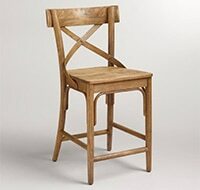 This essentially means we don’t have to debate over sanded or unsanded grout or worry that one product is better for one application, but we better use some other one for something else. Now, if you read the fine print in the “Limitations” section of their brochure, it does nix some application scenarios – like not submerged in a pool or in saunas or steam rooms – but any basic bathroom, kitchen, patio, laundry room, or mudroom tiling scenario should be all good. 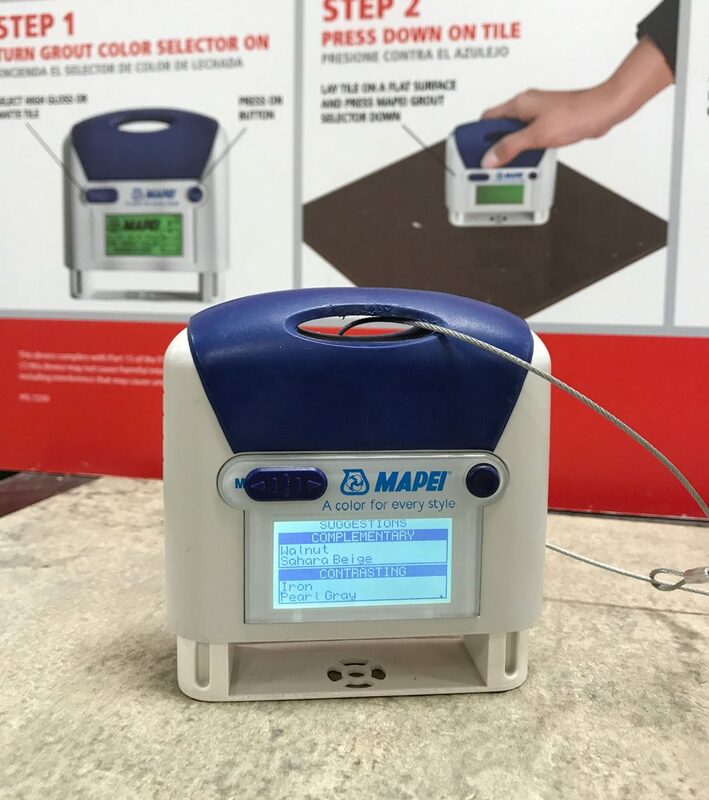 And while they warn you that you should test it on sensitive materials like glass or marble tile first, it does say it’s compatible with those applications too. In the end, if you’re unsure, always double-check or ask an expert at your store, but the range of use here is pretty impressive. Which probably explains why we haven’t purchased any other type of grout for the last few years. This stuff earns my final rose. 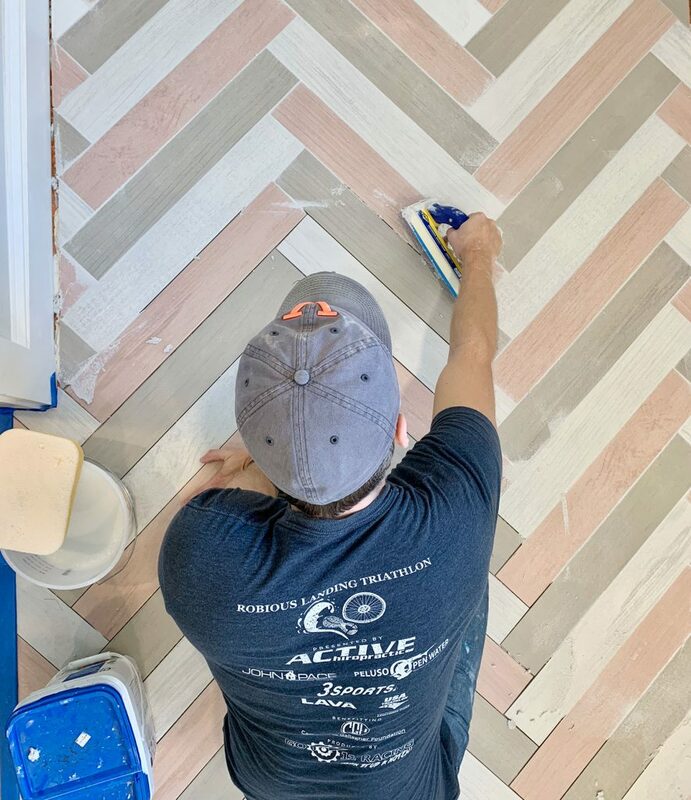 It still amazes me how much grout changes the finished look of any tiling project, so it’s important to give some thought to the color you choose. 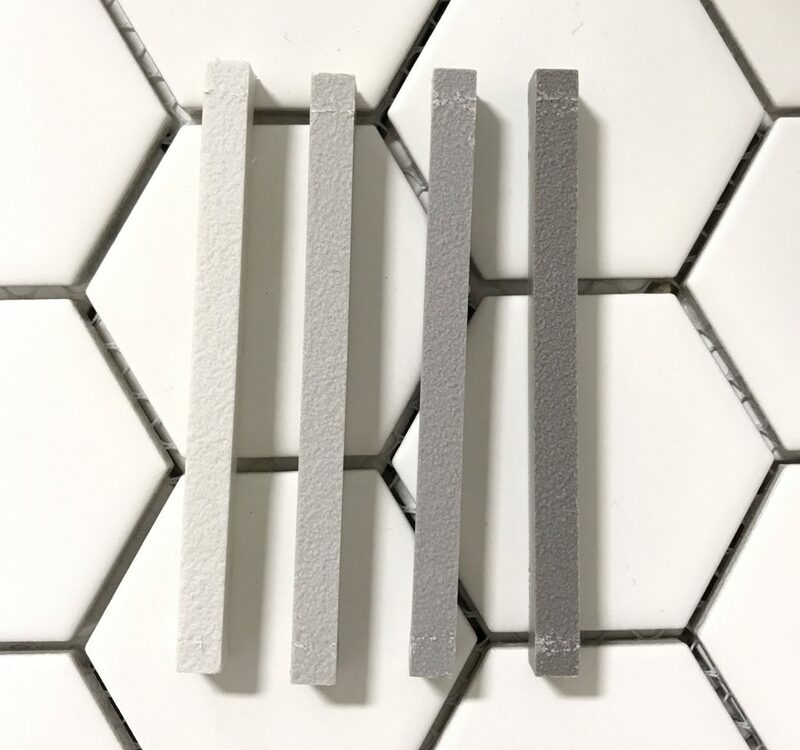 If you don’t believe me, Emily Henderson did a great post a couple of years ago showing off the impact of your grout color section. 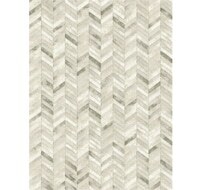 That being said, we use Warm Gray in 85% of our tiling projects. To us, it’s the perfect neutral grout color that offers enough contrast to the lighter tiles that we choose (like white subway tile) while still looking great with darker tiles (it almost reads as white with a darker tile next to it, but isn’t as harsh and unforgiving of dust/dirt as bright white grout would be). 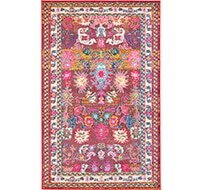 And since it’s so agreeable to so many tiles, you can use it throughout an entire room to help tie your various surfaces together (floors, walls, etc). 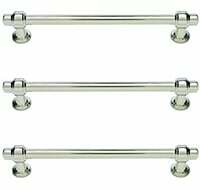 For instance, in the downstairs bathroom at the beach house we used it on both the shower and the floor. It provides a different type of contrast in each spot – but using the same grout helps them work together. And if you study that photo above, you can see what I mean about how crisp and white it looks when paired with darker tile, without being as unforgiving as bright white grout can be. 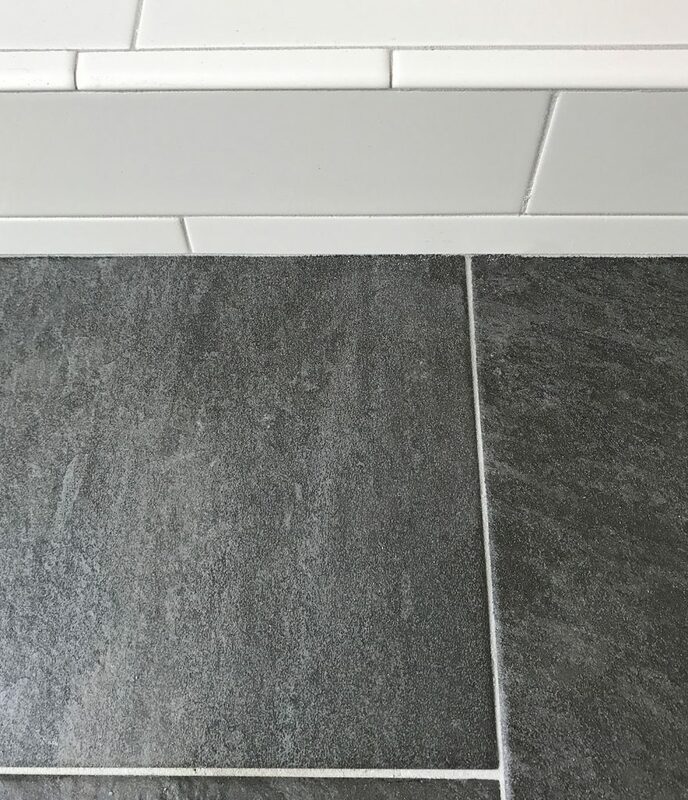 That’s the same exact grout color (Warm Gray) everywhere in the picture above – although it looks grayer when it’s next to the white subway tile and lighter when it’s next to the dark floor tile. Don’t work off of paper samples. You might see posters or brochures around the store with the various grout colors, but they aren’t always super accurate. Instead, ask an employee to borrow the stick samples like the ones shown here. If you ask someone at Floor & Decor they should be able to dig up these little plastic sample sticks for you to debate your options (they don’t usually let you leave with them, so just bring your tile to the store and hold them up to it). 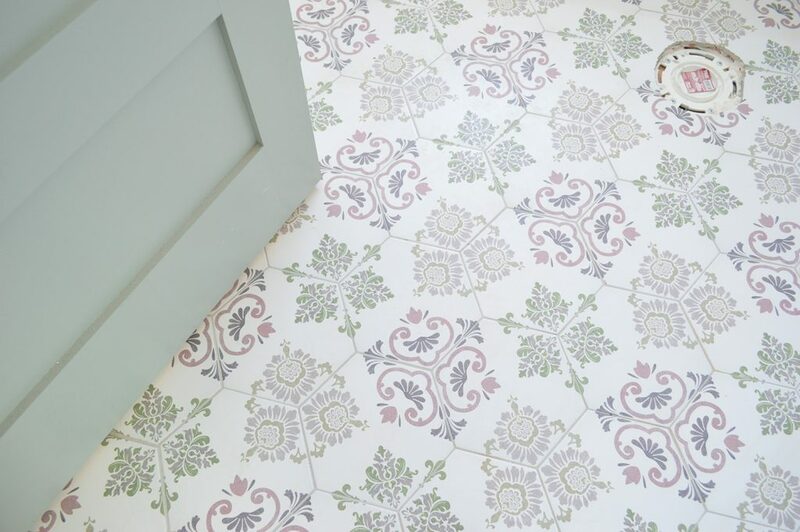 Not only are they truer to color, but it’s a lot easier to place them right onto your tile and get a much better sense of what your final result will look like. Pay attention to undertones. 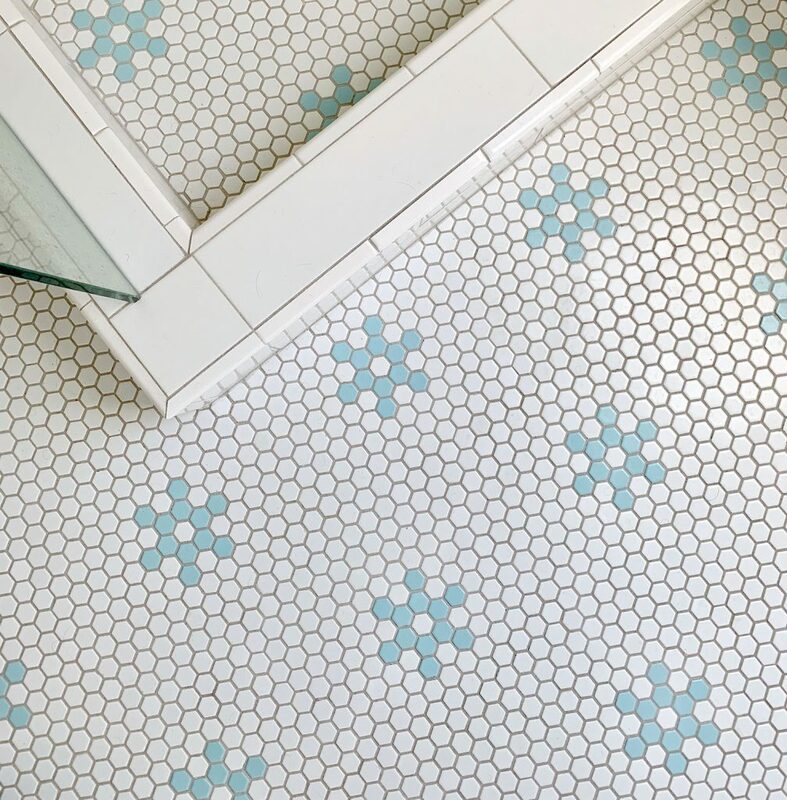 In addition to choosing your grout based on how light or dark it is, note how warm (yellow-ish) or cool (blue-ish) a color looks – especially as it relates to your tile. 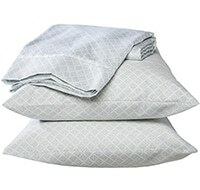 For instance, I said we used Warm Gray in most, but not all, of our spaces. It’s on the warmer side of gray (hence the name), but there’s a cooler gray called Frost that Mapei also sells. We used that in a couple of rooms, like the one below, because the grays on the tile were a bit cooler and we wanted the grout to align with that. 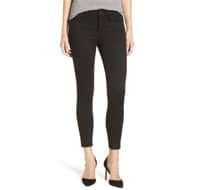 Look around the store for input. 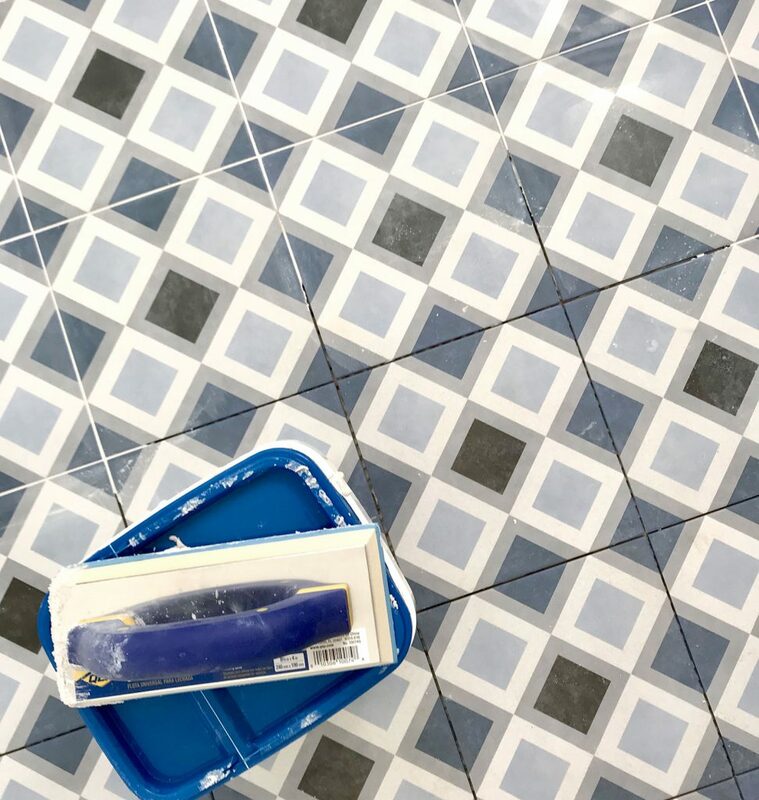 If you’re uncertain or nervous about your grout selection, see what you can learn while you’re in the store. 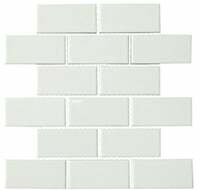 Most tile stores will identify the color that their tile displays are grouted with, so you can choose to just mimic the display grout that they used with the tile you’re purchasing, or you can go lighter/darker or cooler/warmer than what they show if you think you’d prefer that to what they picked. I noticed our Floor & Decor store also has this newfangled grout selection tool. I played around with it a little bit using tiles in the store (you’ll want to bring your own tile if it’s not something you’re buying at the same time) and while I wouldn’t blindly go with whatever it tells you, it could at least help you hone in on a few finalists. Now, this Mapei grout doesn’t seem to leave more or less grout haze than any of the other grouts we’ve used (you know, that film on your tile that’s often leftover once your grout has dried). And grout haze is one of my least favorite things in the world because it’s like the LAST THING I want to spend time on after having survived tiling and then grouting. So a thing I experimented with in the duplex that worked really well was doing a preemptive tile wipe while the grout was still wet. I don’t have any pictures of this, so let me explain. It only really works with larger tiles, but after I applied the grout with my float and did a couple wipe downs with my damp sponge, I let it sit for another 5-10 minutes and then I used a rag or paper towel to dry just the surface of the tile, being sure not to rub the grout lines themselves. It sounds more tedious than it was, because it really was only one quick swipe (almost like washing a window pane) and it basically wiped up all of the liquid that would eventually become grout haze. Again, it’s really most practical on larger tiles where you can safely wipe the tile without touching the wet grout, but it completely saved me from having to buff the floors or use a grout haze remover after the fact. And you know how much I love to eliminate extraneous steps! Long story short: next time you tile, grab some Mapei Flexcolor grout (maybe in Warm Gray) and think of me fondly when it makes things easier. PS: If you’re new to tiling and want to see the process from start to finish in one post, check outhow we tiled this kitchen backsplash for $200. 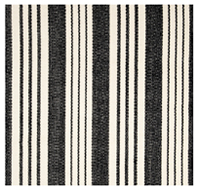 And here’s a post about all of our duplex tile choices & one about our beach house tile picks.